A couple years back someone tacked this added message below the warning sign that really states the obvious. 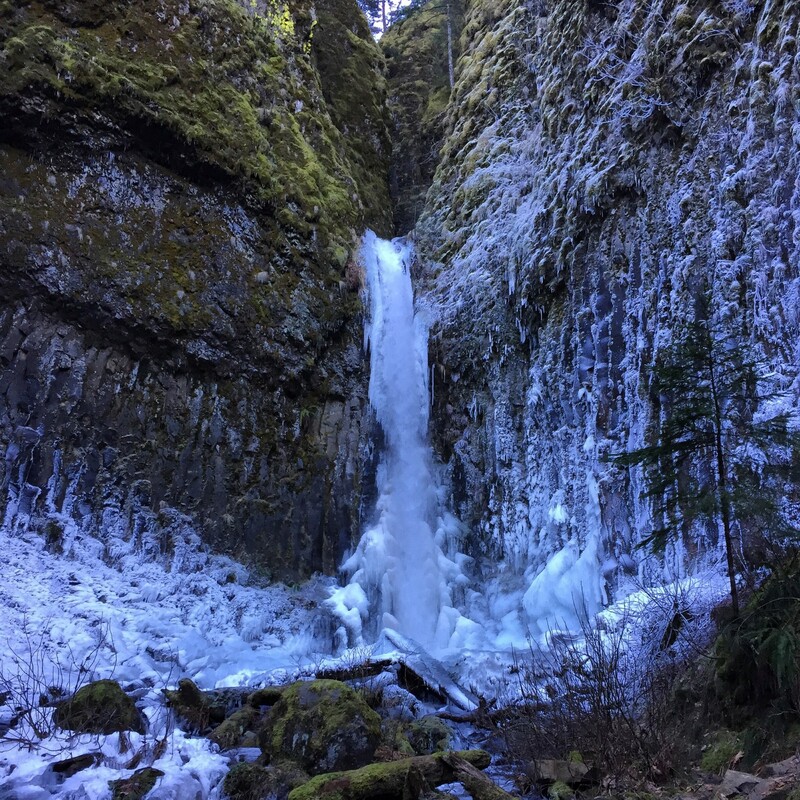 Be prepared when exploring Oregon during the winter months. And don’t always rely on that GPS. Many forest roads, while beautiful alternatives from the main highways and freeways during the snow free months, are not maintained during the winter. Travelers should be aware that even a few inches of snow can obscure icy roads and soft shoulders where vehicles can become stuck. Winter storms can trigger unexpected rock slides, and falling limbs and trees; they can quickly change driving conditions on forest roads from passable to impassable in a matter of minutes. Keys to safe winter driving: Plan for the unexpected. Keep in mind that cell phones may not work in remote areas. Check the latest road and weather conditions at TripCheck.com or dial 511 before heading out. Always tell someone where you’re going and stick to that plan. Carry an emergency kit in your vehicle. Travelers should be prepared to spend long periods of time in the car. Blankets or sleeping bags, warm clothes, a snow shovel, water, food and other necessities are recommended as part of a complete vehicle emergency kit. Always fuel up at the beginning of the trip. Weather can change quickly, particularly in higher elevations. 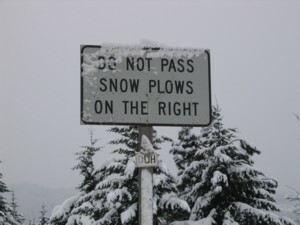 Good snow tires, a 4-wheel drive vehicle, and chains are advised or often required, when driving in winter conditions. As a general rule, always adjust your speed to current conditions and drive at speeds that allow you to stop in half of the visible road distance ahead of you. Helpful information about planning a trip to a national forest during the winter months can be found on the Know Before You Go webpage at go.usa.gov/Cmq. ODOT and the County Maintenance Crews do an amazing job keeping our Highways and Interstates passable. They plow, they de-ice and sand but it is our job to use a little common sense, stay on roads maintained during the winter months, and drive cautiously to make sure we reach our destination safely. 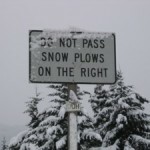 Posted in Columbia River Gorge, Hood River Valley, Outdoor | Comments Off on Don’t Pass Snowplows on the Right! DUH! 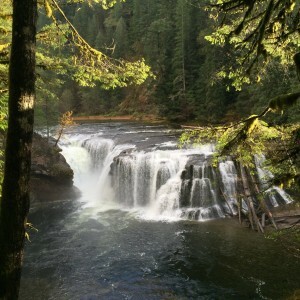 The Lower Lewis River Falls is a beautiful and quite powerful waterfall, fed by the glaciers on Washington’s Mt Adams, creates a nice plunge pool, perfect for swimming in. Be sure to stay away from the falls however, considering this is a glacial river, and one wrong slip could end up sending a person into the powerful undertow beneath the falls, which would almost definitely be fatal. The falls are accessed from the Lower Falls Recreation area, a good starting point for exploring the numerous other waterfalls in the area. Chasing Waterfalls and Waterfall Wednesday. 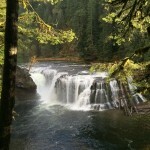 According to Wiki there are at least 238 waterfalls in Oregon! I’m guessing even more than that. Wouldn’t it be grand to witness the beauty of every one of them? With 77 waterfalls on the Oregon side of the Columbia River Gorge alone, we’ve set out to find them all plus those in the nearby Mt Hood National Forest, Washington and beyond. And when we do we’ll share our finds with you, our guests, so you too can set out to Chase Waterfalls. 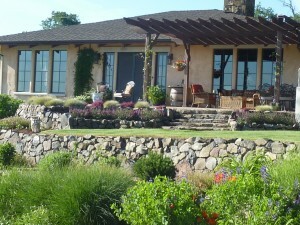 Sakura Ridge ~ The Farm and Lodge is a working orchard and Bed & Breakfast in the foothills of Mt. Hood and an inspected and approved member of the Columbia Gorge Bed and Breakfast Association. Perched on 72 acres in the foothills of Mt Hood, the farm has thousands of fruit trees and gardens filled with vegetables, herbs, and berries. Fresh eggs are gathered daily and there is always plenty of honey from the hives. Sitting on the expansive decks, overlooking the orchards and fields, with an awesome view of Mt Hood, you’ll feel like you’re so much more than only 10 minutes from downtown Hood River. Five well appointed guest rooms, each with a private bath and complete with down comforters, Hudson Bay or Pendleton blankets. Just the right balance between rustic and classy. Breakfast is always what’s in season, what’s from the farm and what is always good to eat. Multnomah Falls is the most visited recreation site in the Pacific Northwest with 2 million stopping each year to take in the views, making it to where a visit to the falls can be challenging. As a local innkeeper I suggest visiting the falls on either ends of the day and midweek to beat the crowds. I also suggest taking the time to hike the 6 miles Wahkeena/Multnomah Falls loop so as to ‘discover’ 6 more waterfalls, if you indeed love to chase waterfalls. Fed by underground springs from Larch Mountain, the flow over the falls varies, usually it’s highest during winter and spring. Multnomah Falls offers one of the best places in the Columbia River Gorge National Scenic Area to study geology exposed by floods. Five flows of Yakima basalt are visible in the falls’ cliff face. 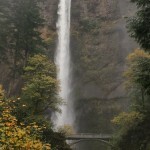 Geocache ‘What’s Behind Multnomah Falls’, GC14VG2, studies the different types of exposed basalt layers. 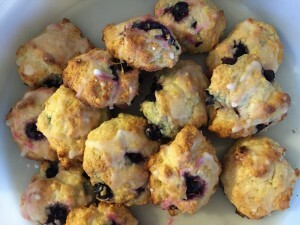 The Old Parkdale Inn Bed and Breakfast shares this recipe for Lemon Blueberry Biscuits which is sure to become a guest favorite using Hood River Valley blueberries. Lemon Blueberry Biscuits are sure to be a sweet treat at our tables of the Columbia Gorge Bed and Breakfast Association. Thanks to Sue, innkeeper at Yamhill Vineyards Bed and Breakfast for sharing this recipe. Preheat oven to 400°. In a large bowl, whisk the first five ingredients. In another bowl, whisk yogurt, egg, butter and lemon peel until blended. Add to flour mixture, stir just until moistened. Fold in Blueberries. Drop by tablespoonfuls 1 inch apart onto a greased baking sheet. Bake 15-18 minutes or until light brown. In a small bowl, combine glaze ingredients. Stir until smooth. Drizzle over warm biscuits. If using frozen blueberries, use without thawing to avoid discoloring the dough. Makes about a dozen sweet and tangy biscuits. 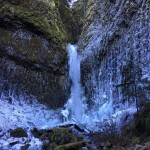 The hike to Dry Creek Falls is moderate to difficult, only because it is a slow 2 mile climb. But oh, so worth it. We hiked in on a very cold, 20° New Years Day, 2015, and found that the creek was flowing and the basalt covered with ice. Also some beautiful ice formations in the creek below the falls. The Vineyardview Bed & Breakfast offers elegant, finely appointed rooms, beautiful vineyard and mountain views at an affordable price. Enjoy lovely patio outdoor seating or our wooden swing in the herb garden or inside in the sunny solarium, perfect for early morning coffee, afternoon tea and evening wine sipping. Fresh Himalayan Blackberries, Italian Plums and Pears grown on the property served up with gourmet coffee & tea, fresh scones or proscuitto parmesan frittata are seasonal breakfast specialties. Vineyardview Bed and Breakfast has four guest rooms and sleeps up to 12 people. The family suite sleeps 6, has a private half bath and is great for parents and children. The queen room sleeps 2, has a lovely window seat perfect for curling up with a good book. The twin room has two twin beds, sleeps 2 and shares a full bath with the queen room. The Honeymoon Suite has a private full bath with indoor hot tub and shower for 2 with a generous walk in closet and mini-fridge. All rooms have TV, wireless internet and DVD players. Nestled among their own Pinot Gris Grape vines, Vineyardview Bed and Breakfast is less than 3 miles from downtown Hood River and minutes from the hiking and biking trails of Post Canyon recreational area. The inn is neighbor to both Cathedral Ridge Winery and Phelps Creek Winery, to name a few. Three Sleeps Vineyard B&B has two beautiful rooms that overlook their mountain vineyard and the little valley in Mosier full of cherry trees and a Mt. Adams view. Only 15 mins from the heart of the Columbia River Gorge and Hood River you’ll feel like you are miles from anywhere. Both rooms have private baths and patios and their own entrances. When the Lewis and Clark Corps of Discovery Expedition traveled through the area in 1805 they asked the local Native Americans how far it was to the Great Pacific ocean. The answer, as you’ve guessed, was “Three Sleeps”. The Three Sleeps Vineyard is the source of Dominio IV’s Tempranillo, Syrah and Viognier grapes and is farmed organically and biodynamically. Each well appointed room at Three Sleeps B&B has a private entrance, bath and cozy seating area. 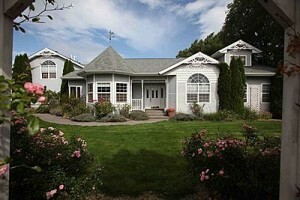 Relax on your patio and enjoy the view of the vineyard, the world famous cherry orchards and Mt. Adams in the background. Both rooms also feature satellite TV with HBO, a DVD and wireless internet. Fresh coffee, tea and hot chocolate are available around the clock just outside your door. Start each day with a hardy breakfast complemented by local eggs and seasonal fresh fruits. Anyone who knows the Columbia River Gorge knows that it offers an extraordinary range of activities throughout the year, including wind surfing, kite boarding and other water sports, skiing and snowboarding, hiking, fishing, birding and many others. And the Wines: ‘A World of Wine in 40 miles’ is the motto of the Columbia Gorge Winegrowers. 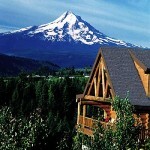 Three Sleeps is located in Mosier, just 5 miles east of Hood River. Immigrants began to move into Oregon Territory in the 1840’s. German brewer Henry Saxer arrived in 1852, tasted the clear, soft water and recognized the prime hop and grain potential. He, along with fellow immigrant Henry Weinhard, began brewing and the rest is history. Stay tuned for information on SoLog Summer Fest 2018, happening in August in Parkdale’s Clear Creek Station. Catherine Creek Trail #4400 is a one mile paved trail with great views of the Columbia River on the south side of WA14. In the spring this is a premier location for Columbia Gorge Wildflowers and bird viewing. No flowers yesterday but we anxiously await the Grass Widow which according to my Instagram feed were in full bloom around the middle of February last year. 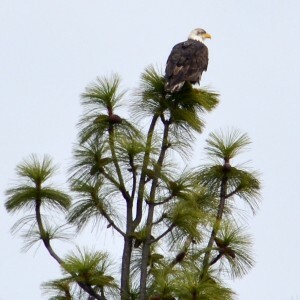 We did see a few bald eagles, hawks, woodpeckers on this quiet winter day. Parking is on the north side of WA14 where you can pick up trails for longer hikes and more great wildflower and bird viewing. You’ll have stunning Columbia River Gorge Views pretty much the whole trail. Interpretive signs guide you through open grasslands, vernal ponds and oak woodlands. Take a break on one of the many benches along the trail, one being a the overlook of Catherine Creek and Catherine Creek Falls. Chasing Waterfalls and Waterfall Wednesday. With 77 waterfalls on the Oregon side of the Columbia River Gorge alone, we’ve set out to find them all plus those in the nearby Mt Hood National Forest, Washington and beyond. And when we do we’ll share our finds with you, our guests, so you too can set out to Chase Waterfalls.